When it comes to your business, wouldn’t you want to use all possible strategies to help improve traffic? Isn’t it important to brand yourself as an authority in your market? Businesses are constantly fighting to gain the smallest of margins to help improve visibility and gain qualified traffic. Businesses know all about advertising, and that’s great. However, what if I was to tell you another way you could help improve traffic and position your business as a leader in the industry? That’s where we get to blogging. If you haven’t heard yet, blogging is the concept of writing content about whatever topic you’d like. It could be considered a diary, or your thoughts and opinions on a certain topic or industry. How much you blog depends on how much time you want to invest into it. However, the more you blog, the more fresh content you can produce which can lead to more qualified traffic to your site and ultimately convert to leads and sales. Think of it as a long-term investment into your company. Now that we’ve gotten that out of the way, let’s actually discuss HOW blogging can benefit your company and your website. Blogging regularly will allow the personality and voice of your company to come out and be heard. Too often, companies can come across as faceless organizations. But by offering up thoughts and ideas on topics relevant to your industry, you can show the desired personality of your company. Showing a little humor or empathy can go a long way into creating a positive perception in your target audience’s mind, and it gets consumers to feel more comfortable with your brand. Creating the proper voice can help to reach your target audience. Not only will blogging show off your company’s personality; it will also allow your business to market itself as an authority on the topic. Consumers are getting smarter by the day, and there are billions of daily searches on Google and Bing. Consumers are constantly seeking out answers, and if your blog can answer their questions relevantly, you can leave a lasting impression on your audience. Customers that read your blog and can see that you know what you are talking about are more likely to have a positive perception about your company, which can convert leads into sales. By regularly blogging, you are providing fresh content on your website for people to read. You can also use your blogs as content for your various social media platforms. Dispersing content through your social media platforms gives it the added chance to be reposted, retweeted, or shared by your followers. Not only is that valuable added exposure for your company; social shares also give your website more credibility. This goes back to helping to market your company as an authority. Consistently coming up with articles is an investment for your company. Content marketing pays off in the long run compared to pay-per-click advertisement. Blogging can offer your company insight into what consumers are thinking. By updating your site regularly with new content, you can track over time what types of articles were more successful. This is valuable information that can help your company re-adjust what they are doing both on a marketing level, and perhaps even a product level. Using Google Analytics can give you valuable insight on how/when/why users are interacting with your website. If you want to get a better idea of how blogging can lead to sales, look no further. Per business2community.com, regular blogging can increase your company’s leads by 126 percent. I don’t have to tell you that is a monstrous number. Simply blogging won’t result immediately into sales. The purpose should be two-fold: earn a following, then convert into sales. At first you might only earn a reader’s email, but that is valuable information that, through strategies such as email marketing, can turn into future sales. This is the type of effort for your company that is worth your time. Remember earlier when we discussed how blogging is a long-term investment in your company? Well, here’s how. There’s a reason why certain websites are consistently ranked higher in Google or Bing’s search results. It’s because those websites have invested heavily into search engine optimization also known as SEO. Search engines like fresh, original content. Google and Bing send out what we call “spiders” to view your webpage. These spiders are looking for hundreds of different indicators which help to rank your webpage higher on the search results. A lot of weight in the Google algorithm is put into consistent new content that answers the questions of its users. If you consistently update your blog with new ideas that answer the user’s questions, the algorithm can bump your website up higher on the search results. Whatever the topic is, you can fit in keywords for your product and industry. It’s these keywords that users search into Google and Bing. Blogging consistently provides you with the opportunity to use those keywords. You have to be careful though as search engine algorithms are becoming aware of keyword spamming. It’s important to do it naturally in your blog posts. I recommend signing up for a free Google Adwords account and using the keyword planner. Chart Courtesy of Backlinko.com. Comparing Google search position vs Domain Authority of Backlinking Website. Creative blogging heightens the possibility of getting backlinked. Backlinking is the concept of another website linking your article. Backlinking is one of the indicators that spiders look for when checking out your website. If your blog is able to get backlinked by a domain with high domain authority, this increases your score with the algorithm. You can also backlink to your own content. Once you start building up a library of blogs, you’ll be able to link to past relevant articles you’ve written. Before you start blogging, it’s helpful to understand who your audience is and what it is they’re looking for. You can create a persona for what you think your typical target audience would be. From there, you can cater your blogs to what they like. Over time, you’ll better learn to understand the needs of your target audience. Understanding your audience will help your business better position itself to them. Use visuals. As much as possible, use original pictures that you’ve taken, but if you have to use someone else’s photos, make sure you’re using royalty-free images. Relevant photos, videos, and graphs can help to tell your story and provides readers with a better understanding of what you’re trying to say. Take advantage of the alt text. Alt text is used in HTML, and it’s used to describe what the image is. For example, if your image is a cat playing with yarn, you might literally want to put “cat playing with yarn” in the alt text. The spiders that visit your page can use this information to your website’s advantage and help with the SEO. Use short paragraphs. No one wants to read 30 sentence paragraphs without any breaks. Try to keep your paragraphs to around five or six sentences at most. In between paragraphs, try to use visuals that help reinforce your point. Have fun with it. 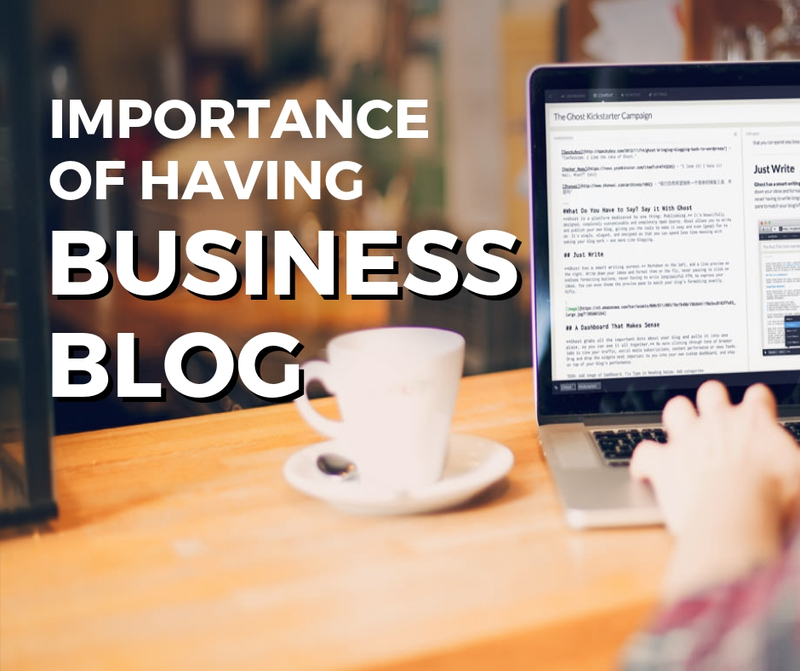 Blogs aren’t meant to be very formal business reports. Let your personality come out in your blog. This is where you can show off your company’s personality. Everyone uses paid advertising to get their product into the minds of their consumers. However, it’s taking more and more effort to get the same effect. Consumers are able to tune out the thousands of advertisements they see every day. With blogging, you’re able to answer your customer’s questions with more depth than a quick advertisement does, and in a way that doesn’t seem so in your face. Consumers can appreciate that. Blogging is an excellent way to help differentiate your company from the other ones and provide the voice it once didn’t have.